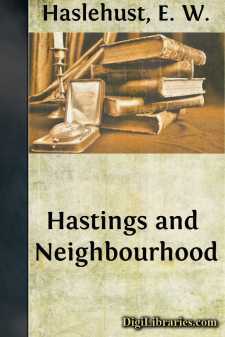 Hastings is the gateway into an enchanted garden. Between the hills and the sea it lies—the most romantic province in this England of ours. Scarcely a place in it seems to belong to this present: from end to end it is built up almost entirely of memories. The very repetition of the names—Rye, Winchelsea, Pevensey, Battle, Bodiam, Hurstmonceux—conjures up the past in all its magnificence and all its sadness. Nowhere in so small a space shall you find so many monuments to the greatness of England's former days, to the imperishable glory of her people; nowhere in our coasts shall you find a stretch of land so crowded with the ghosts of dead men and dead empires. If for this alone, the territory, no matter how ill-favoured and unattractive, would be worth visiting and revisiting. But there is yet another call—that of the intrinsic beauty of the country-side. And the call here is insistent. Hills and the sea; great folding downs and little valleys dropping fatness; immense stretches of lonely marsh and the nestling charms of copse-hidden villages; gentlest of streams slipping lazily through peacefullest of domains; wildest of breakers spending themselves at the base of steep tawny cliffs. Thus is the land compact. One is always reminded of a passage from Mark Twain: "That beauty which is England is alone; it has no duplicate. It is made up of very simple details, just grass, and trees, and shrubs, and roads, and hedges, and gardens, and houses, and churches, and castles, and here and there a ruin, and over all a mellow dreamland of history. But its beauty is incomparable and all its own." And search where you will—north, south, east, west—nowhere can you come upon a spot to which these words might with greater fitness be applied; for this sequestered little area is the microcosm of England. Despite its wilderness of bricks and mortar, Hastings itself is, under certain conditions, a place by no means unbeautiful. Possibly it is from the sea that it appears in happiest mood. One can take a boat on a high summer's morning, when the sun is shining gaily on its steep grass-capped cliffs, its fragment of castle ruin, its red and blue-grey roofs, when the sea is mazing away into every tint of emerald and sapphire. Then it is a place fair to behold and pleasing to remember. Or one can clamber to the top of the castle hill, and, Janus-like, comprehend the town in its entirety—eastwards the old town and the Past; westwards the modern watering-place and the Future. Then it is a place for soliloquy and moralizing.